At the beginning of the Schemin'! Phase, discard any Bullet cards you have drawn. In this way, your Hand is lightened. At the end of the Schemin'! Phase, you are allowed to keep in your Hand the cards you are interested in holding for next Round. Discard all Bullet cards. Discard all Action cards that you are not interested in. During the Stealin'! phase, place the performed Action cards you get back from the First Player face-up on your discard deck. The Bullet cards you received that turn from your opponents, however, go on top of your draw deck, face-down. At the beginning of each Round, draw cards from your draw deck and fill your Hand up to six cards. Each time your draw deck is depleted and you have to draw cards, shuffle the discard deck to make a new draw deck. You can look through your discards at any time. Make the train by using the Locomotive and the four Cars of your choice. Each player chooses a team of two Characters. He takes the corresponding cards and pawns. For your first game, we advise you to use the following teams: Tuco and Cheyenne vs. Django and Doc. Place one Bandit pawn from each team inside the two Cars at the rear of the train. Place the two Character cards of your team in front of you and place the six Bullet cards at the left of each of them and a $250 Purse on each of them. From among the Action cards of each Character, get rid of all the cards in duplicate as well as one Marshal card from the Character of your choice. You will have 11 cards remaining in your Hand: 2 Fire (1 for each Character), 2 Punch (1 for each Character), 2 Move (1 for each Character), 2 Floor Change (1 for each Character), 2 Robbery (1 for each Character) and 1 Marshal. Shuffle all of them to make your draw deck. 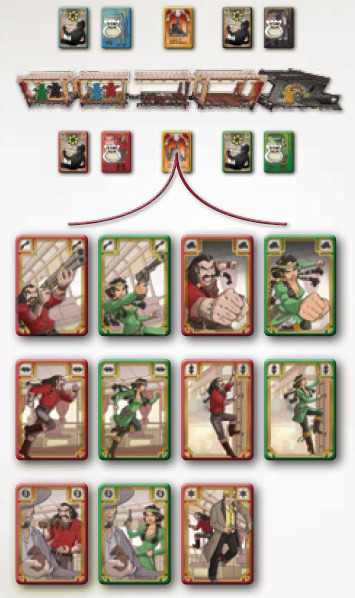 Each player then plays with the mixed Action cards of the two Bandits. The game with two players is played with the Expert Variant described earlier. The goal of the game is to have the richest team at the end of the game. However, no one wins the title of Gunslinger in the 2-player game. When a Bandit is shot, the Bullet card is placed on the top of the player's draw deck. It may very well happen that a Bandit will inadvertently shoot his own teammate!